A client liked our original “Zia Colorida” (the “Zia Sun” is the icon of New Mexico), and commissioned a re-creation (we don’t do — or attempt! — replication). This was the result. The hands were made by printing out a nicely formed handprint from the web (as received, and flipped), resized to fit the panel application. I cut out the handprints with an X-acto knife and stuck them to the glass piece with a glue stick, then overpainted by daubing the margins with Pebeo Indian Red. After drying, baked in our kitchen oven for 45 minutes. Crude, simple — and easy! HI Chris, glad you were inspired by the hands – do you think you might give it a go yourself? Larry is so talented with his work. What a great idea for the hands! 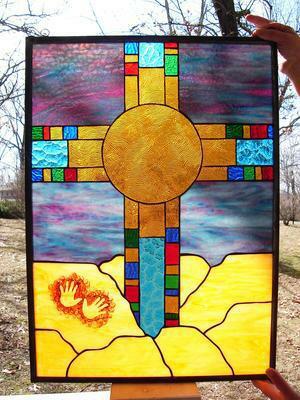 The cross itself is beautiful and the hands lend a personal touch. Thanks for sharing your creativity. ?